Most artists think waaaay too hard about it, while others don’t think about it at all. In both instances, the artists fail to make any sort of real connection. So this article is here to hopefully uncover the “mysteries” of networking and put it in simple and easy steps to help you make better relationships. Because that’s essentially what networking is about, relationships. Truly and genuinely connecting with people. Many people hate the term “networking” because they see it as “talking to people only because you want something from them” which is definitely NOT the case. As a matter of fact, the best networking happens when you are genuinely interested in learning about the person you’re networking with. So lets start by talking about the two different types of people, or in this case, artists. Most artists tend to be introverts. So if you’re one of those people who just likes to focus on the music and you’re not really a “people” person – see this as an advantage. Why? Because the fact that you generally don’t want to be bothered means that you’re probably not a pushy person. You understand that people don’t like to be pushed into anything, which can be an advantage when it comes to networking because it’s all in the approach. Now on the other hand, you might be the social artist – the one that enjoys going out to events, meeting new people and of course, you don’t have a problem with hitting someones inbox with a music link. That’s all good and well and can also be used as an advantage when it comes to networking, however in order to really connect with people, you might need to tone it down a bit. The key is to find a happy medium between the two. BALANCE is key to networking. Personally, I’ve gotten indie artists posted to numerous mainstream outlets, have made some amazing connections with people who I personally am a fan of and truly look up to, and I’ve built a community of artists, bloggers, journalists and just all around amazing people who keep me motivated, teach me new things on the daily (whether they know it or not) and ultimately support my endeavors. Because of this, it’s given me numerous opportunities to continue to do what I love on a daily basis. But I don’t do this by speaking with every person I come across and telling them about what I’ve got going on. I do this by genuinely and selectively building relationships with people who I could possibly help in some way. So networking rule #1 is: Don’t try to talk to everyone. Instead, look to build relationships with people who you can help or those who already show interest in what you have to offer..
As a matter of fact, networking is never about YOU, it’s about THEM. Your first conversation with someone should be mainly about the person on the other end, it should never be a sales pitch. That’s where most artists go wrong. You wouldn’t believe how many times artists hop in my mentions or DM’s with just a random link to their music – they don’t follow me, they don’t introduce themselves, I don’t know them from a can of paint, yet all I get is a music link. I see other industry professionals express their aggravation towards this tactic ALL the time. Can you see how that’s just NOT an effective way to network? If not, let me break it down even more. You are sending your music link because you want that person to take the time out to listen to your song and maybe even share it AND give you feedback – YET, you didn’t even have the common courtesy to say hello. In the words of Stephanie Tanner from Full House, HOW RUDE! You have to remember that these are REAL people on the other end. People with emotions. Popping up out of nowhere with a request is unheard of in the real world, and this same rule applies online. Networking is not a 1 time thing (I call that “wham bam thank you mam” networking). That’s not the goal here. When it comes to networking, the ultimate goal should be relationship building – and great relationships take time to build. So your ultimate goal when networking should be to make a connection and a good impression. You want to create a good start to a budding relationship. So although you may want that person to listen and give you feedback or maybe even post your music, that probably shouldn’t be the first thing you EXPECT when networking. The only expectation you should have when networking with someone is to make them aware of you and have a great start to building a real relationship. So Networking Rule #2 (which happens to be one of the BIGGEST and most effective rules of networking) is that your first conversation is never about you, it’s always about them. 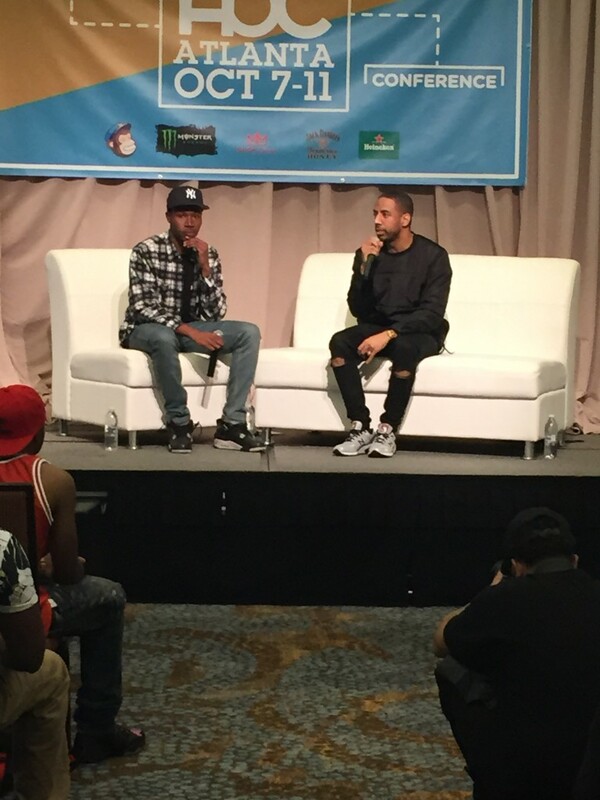 Don’t worry about pitching your music. Don’t worry about asking to get booked for a show. Just genuinely “build” with the person. Ask them about what they do and how they got there. 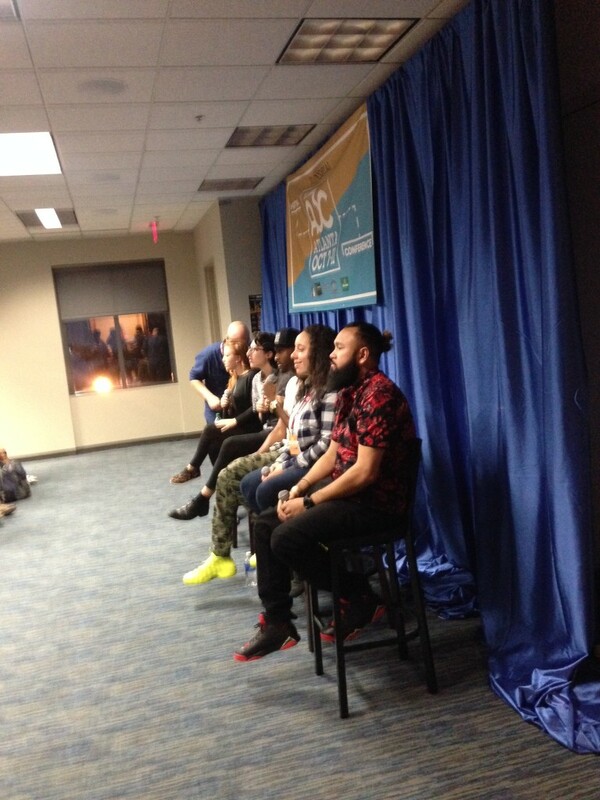 Talk about their experiences and relate to them. Great networking happens when you take the time to learn about the person. This of course doesn’t necessarily apply to meeting people out at events, but outside of that, networking takes time. Networking Rule #3: Give it time. The key to making the best connection is to learn more about the person before reaching out to them. That way, you can relate to them, plus it shows that you’re genuinely interested in supporting them too. So Networking Rule #4 is: Researching those who you want to build a relationship is a MUST. Lets say you really want a certain outlet to post your new video. Check out the content that gets posted to the outlet you want your music on. See if your music would be a good fit. While reading through the articles on the site, take a peep at the author. Follow them on Twitter. As a matter of fact, connect with them on as many social networks as possible. Share a post that you really enjoyed and shout them out. Engage with their tweets over a period of time (retweet them, share your thoughts on something they posted, check out their personal website if they have one, etc.). Get to know them over time. Don’t be in a rush to reach out and ask them for a favor. Support them. And when you do finally decide to reach out, formally introduce yourself. By that time, they’re probably already at least somewhat familiar with your name because you’ve been interacting with them on social media for a while. So simply start a conversation with them. Don’t send them a link to your music. If anything, ASK them if they accept music submissions and find out how they prefer to receive them. Actually, check their twitter bio before you ask if they accept music submissions, they might have their submission email right there in plain sight (in that case feel free to send them a professional email addressed to them personally). Whatever you do, don’t send a link to your music until they let you know they’re interested in hearing it. So Networking Rule #5 is: Don’t force the connection. Networking Rule #6 – When all else fails, be professional. What do I mean exactly? Well, there’s a few characteristics of being professional. All of the above points I’ve made represent professionalism, but what I really mean is – make sure that you’re representing yourself in a professional manner. Speak to people like you would speak to your boss. Be respectful. Use proper grammar and formal introductions. 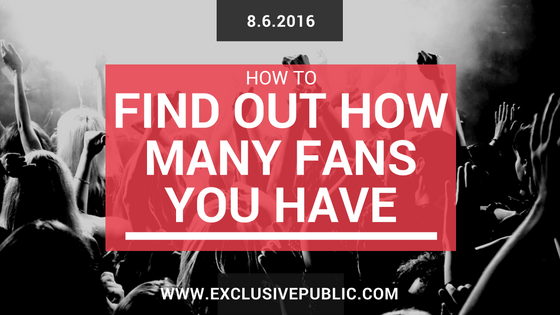 Do you know how many fans you truly have? If not, have no fear because we’re here to show you how to find them. But first, let’s define what a fan actually is. A fan is someone who checks for you (they want to know everything that you have going on). They’ll share your music, they’ll tell all of their friends about your new song. A fan is also someone who will spend money on you – they’ll purchase your music, they’ll buy your merch, they’ll buy a ticket to a show if you’re in their area. Basically, a fan is NOT just someone that follows you on social media. So how do you find out exactly how many fans you have? You can do this in a few ways, but my favorite (and most accurate) way to do this is by having a NEWSLETTER. Your NEWSLETTER is your VIP section. 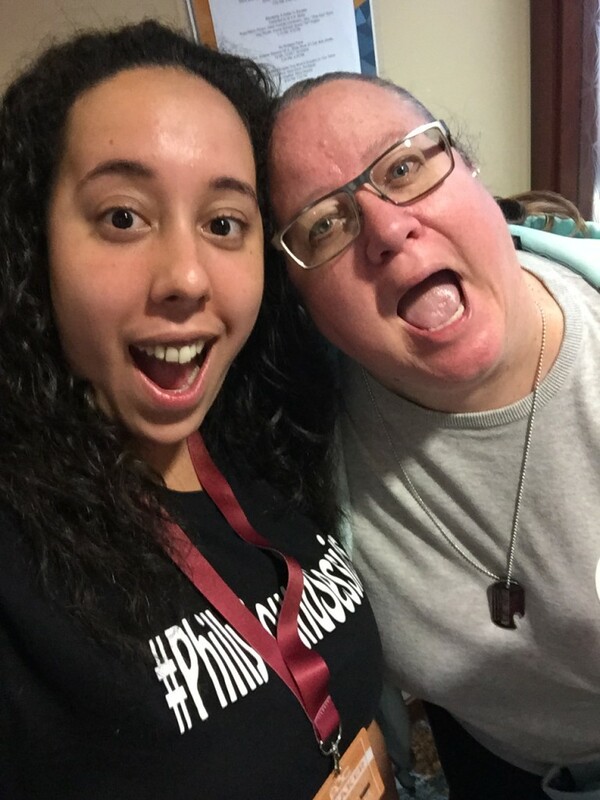 Your SUPER fans will want to be on your newsletter because your newsletter gets all of the exclusive stuff (they are the first to get the new music, discounted merch, free giveaways etc.) Reaching out to your current audience and seeing how many people you can get to subscribe gives you a very measurable idea of how many fans you have. When someone subscribes to your newsletter they are giving you permission to market to them. Do you realize how awesome that is? 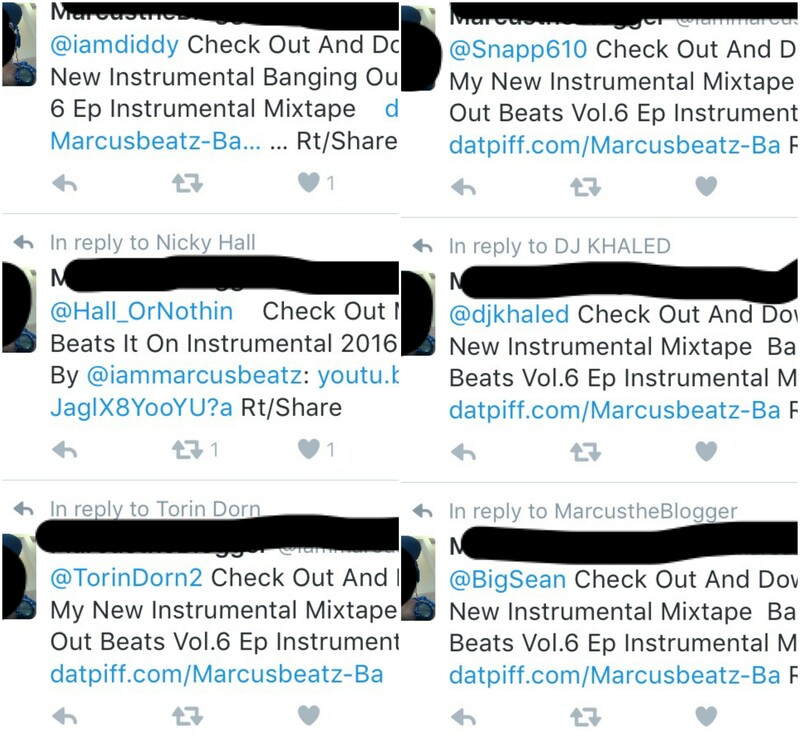 These are people that WANT you to send them your new music so they can share it with their friends. These are people that WANT you to send them a discount code for your merch because they want to buy it. These are people that WANT you to send them an email about your new show because they want to see you perform. Do you understand the magic that can come of this? So for instance, you recorded a single off of your upcoming album and you’re looking to release it next week. You have 1200 people that are subscribed to your newsletter. The night before your new single drops, you send out a newsletter to your fans with a link to the new song. You express how much you need their help in spreading it around. Even if only HALF of those people open up that email, you’re still getting 600 plays, almost IMMEDIATELY. AND if it’s a good song, you should also have at least 50-100 shares, depending on how in-tune people are on your list. All of that and all you did was send out ONE EMAIL! You just dropped this new line of merch and you’re selling it for $25 a shirt. So, the day that you drop the new merch, you send an email to your newsletter with a discount code for your new merch. You let them know that because they’re on your newsletter, they get the discount code which will give them the shirts for $20 instead of $25. The kick is, the sale will only be available for 24 hours. Even if only HALF of your list opens the email, how much do you wanna bet that you make AT LEAST 25 sales of your shirt within 24 hours? …and again, all you did was send out ONE email. You just sent ONE email and made $500. Can you imagine all of the money that you’ve been missing out on???? ALSO, did you know that when you send out an email to your newsletter, you can track exactly who opens it, what links they click on, and you’ll even see where they are located! This means that if you have fans in a certain area, you can actually travel to that area for your tour. And since you can track who opens your emails, you can create a new list of people that always open up your emails and give them the super crazy discounts and exclusive updates. I can literally go on for hours about the many ways you can utilize your newsletter. So now it’s time to create your newsletter and find out exactly how many fans you have. Go to mailchimp.com and create an account (it’s free). There are other programs that you can use to create your newsletter but after experimenting with many of them, Mailchimp is our favorite for numerous reasons. Once you have an account, go to LISTS and “create new list” – you can call this list whatever you want (I suggest calling it FAN NEWSLETTER). Once you’re in the list, you’ll see an option to “create subscribe form.” You can design your subribe form to match your brand. 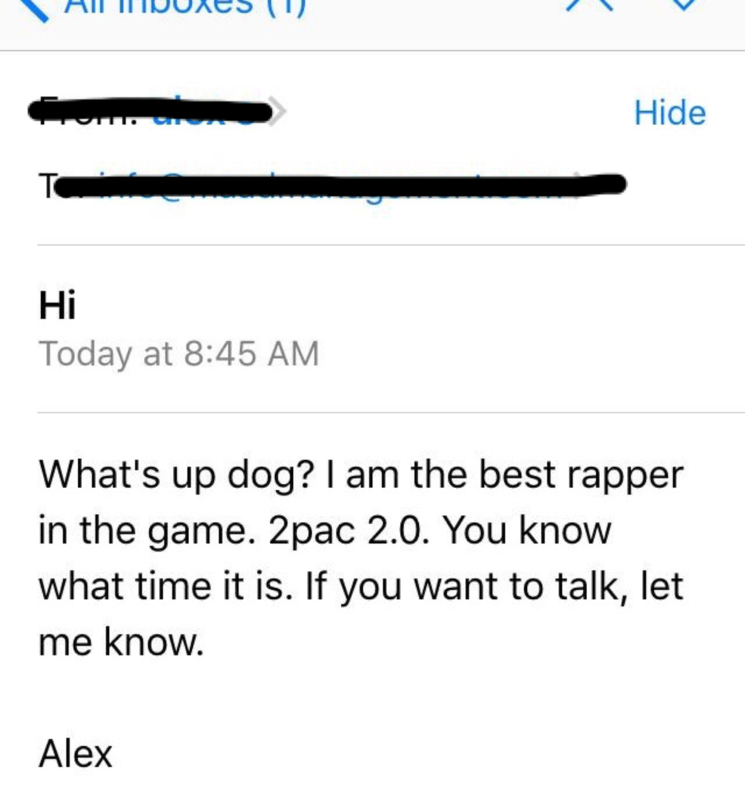 Send out your first email. You do this by logging into Mailchimp and creating a new campaign.Everything is drag and drop so it’s really simple. You can even create a template that you can save and utilize again. Once you send it out, wait a little bit and click on REPORTS to see who opened it. But there’s something very important that you need to know before you go. Your newsletter will only be effective if you collect emails from people who are genuinely interested in receiving updates from you. This means that you should definitely stay away from finding random emails online and adding them to your list. Also, blogs and press don’t go on this list (unless they personally subscribe on their own). Blogs/press get personal emails directed to them specifically. Make Google Your Best Friend – There’s so much free information out there for you to utilize, the fact that most indie artists do not research every little thing is really baffling. If you want to know how to book shows, if you want to know how to promote your music, hell if you want to find someone’s contact info, 99% of the time you can find the information online. You just have to look for it. So in 2016, make a vow to yourself that you will research every little thing that you are unsure of and read more articles like this one EVERYDAY. To help you out, here’s a few sites to bookmark: exclusivepublic.com (shameless plug lol), Sonicbids Blog, raprehab.com, hypebot.com, and musicthinktank.com to name a few. Spice up your social networks – If utilized the right way, social media can really be an awesome asset to your music career. For 2016, make sure that all of your social networks have the same name, same profile photo and same mini bio, that way you’re both easily searchable and easily recognizable across the board. Also make sure that your photos are high quality (go take a photo shoot if you don’t have professional photos). Create Your Website – One of the first steps to really stepping things up a notch in 2016 is making sure that your digital presence is professional. Having a website that represents your brand, where people can go to listen to your music, watch your videos, get updates and subscribe to your newsletter is extremely important and helps tremendously when it comes to promotion. If you don’t already have a website, contact us and we can create one for you. If you do have a website, give it a new look for the new year. Plan Out Your New Releases – The days when you recorded a song and then posted it online as soon as you hop out the booth are OVER. You really have to utilize your time wisely and plan out your strategy for success. This year, make a vow to build anticipation for your new music by creating a strategy for each release (and don’t drop a project until you have an army of fans checking for it!). If you need our help, contact us, we got you covered. Curate Your Own Show(s) – This year it’s about making waves for yourself and not waiting on anyone to grant you an opportunity. This year, instead of paying for a showcase slot or relying on people to book you for shows, I want you to go find a venue, book it yourself, book a few other upcoming acts for the line up and put on your own show. It will be extremely fulfilling and you will learn a lot. I promise. Organize Your Contacts List – Do you have a spreadsheet that contains all of the blogs, writers, DJs and outlets that you can send your music to? If not, you’re totally missing out. 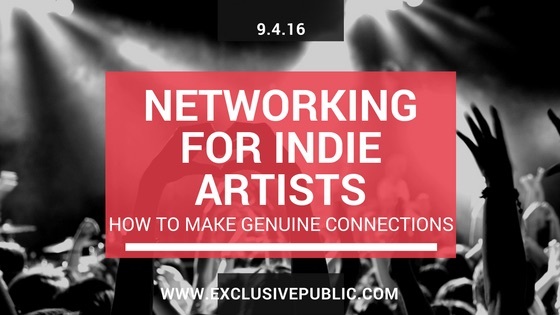 Before you start promoting your music, you must know WHO you can send it to. You should never just “wing it” you should have a plan. Create a spreadsheet using google docs or Excel, write down the names of your contacts, their email, their outlets and their social media. This will save you a huge headache. Create a Mailing List and send out your first newsletter – Imagine getting an INSTANT 500-1000 views on your new video the hour it drops? Imagine selling out your latest show within the first week? Imagine selling enough merch to support your music career? Having a mailing list and sending out consistent newsletters to your fans is a great way to accomplish this. Go to mailchimp.com right now and create an account. Start asking your fans to sign up to your newsletter if they want your new music first. If you need help with this, contact us. Delete all Unmixed music from online – First impressions are lasting impressions. If your music is half finished and not even close to being mixed or mastered, it has no businesses being anywhere near your soundcloud. Before 2015 is over, clean up everything that you have online that doesn’t give people the best first impression of you. The last thing you want is to make a bad impression because you put up your music before it was ready. Create an email signature with your links – Do you know how many emails we receive whether it’s for business inquiries or music submissions that do not have any links or contact info? TONS! In order to avoid this in 2016, I highly suggest that you create an email signature (you can do this in your email settings) that contains your contact info and social media links, that way you don’t have to worry about it. 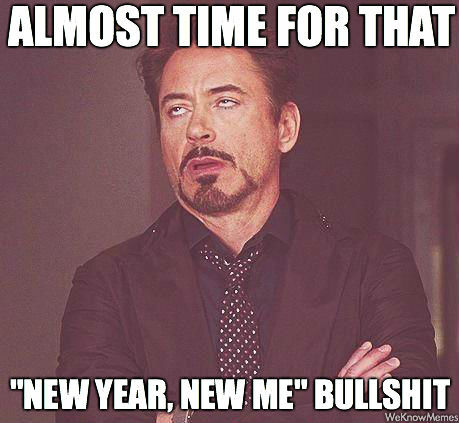 Make a Vow not to spam anyone this year at all – What does this mean exactly? DO NOT SEND A LINK TO YOUR MUSIC TO ANYONE THAT YOU DON’T KNOW. Effective promotion engages people. It’s not pushy or spammy. The best way to reach new people is to get the people that are already in tune with you promoting for you. If you can’t make 10 of your friends share your music to others, you have to ask yourself how hot your music really is. So in 2016, engage, do not spam. Resist the urge to @ people and tag people that you don’t know with a link to your music. Instead, engage with them. Retweet them. Join in on their conversations. Ask them how they prefer to receive music submissions before you send a link to your music. 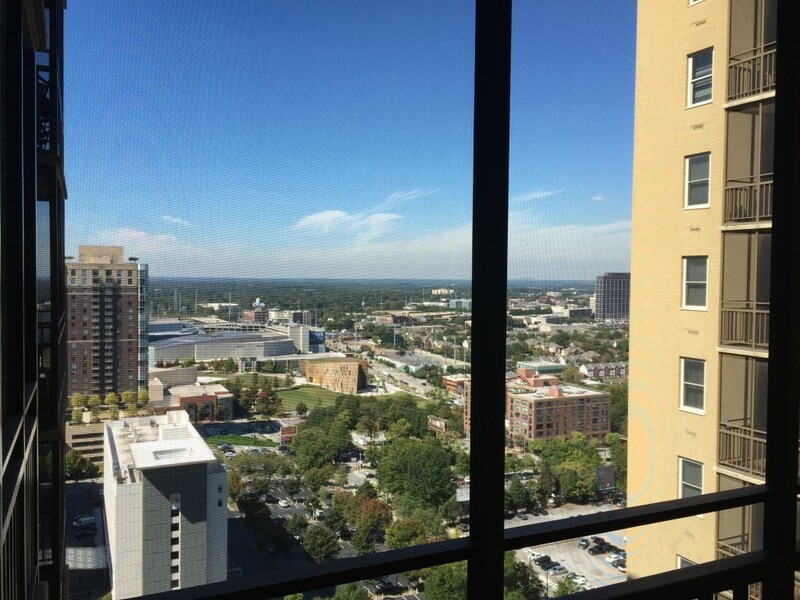 Make 2016 YOUR YEAR, FOR REAL THIS TIME! If you need help, don’t hesitate to contact us! We have basic packages to get you started all the way up to full blown PR campaigns for your music. Contact us directly at admin@exclusivepublic.com and one of our representatives will reach out to you shortly. Exclusive Public’s Got That FUNK. We are now representing George Clinton’s Granddaughters, Kandy Apple Redd! With Comments Off on Exclusive Public’s Got That FUNK. We are now representing George Clinton’s Granddaughters, Kandy Apple Redd! Have you ever heard of George Clinton of Parliament Funkadelic? Of course you have! With hits like “Flashlight” and music that has been sampled by most well known rappers, if you don’t know who George Clinton is, you must have been hiding under a rock all this time. George Clinton and the PFunk family have been around for decades. 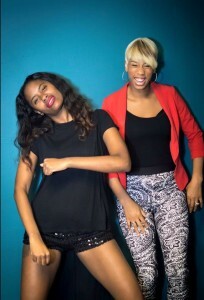 Most recently, their music has been featured throughout the Compton movie and was even featured on Kendrick Lamar’s last album and now it seems that the apple doesn’t fall far from the tree, Kandy Apple that is, as George Clintons granddaughters Tonysha and Patavia, who make up the sassy group called Kandy Apple Redd aim to keep the legacy alive by releasing their own album in 2016. 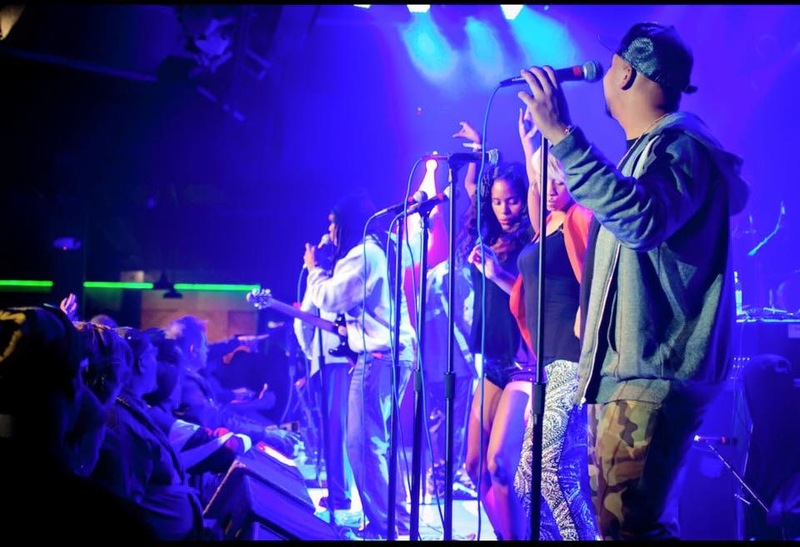 Currently on a world tour with their grandfather George Clinton, Kandy Apple Redd have been recording an album of their own, and we’re excited to announce that they have joined the Exclusive Public team in order to make sure that they do it properly. We’ve been working with the girls and their label, Home Grown Entertainment for the last few months, building their websites, picking songs for their upcoming album, building their social media presence, booking shows and interviews and more. Currently the girls are preparing to release their first single entitled “Bring It Home” which features George Clinton himself. Stay tuned to see what the girls have in store! For now, be sure to follow them on Twitter @KandyAppleRedd and check out their website www.KandyAppleRedd.com for more updates. 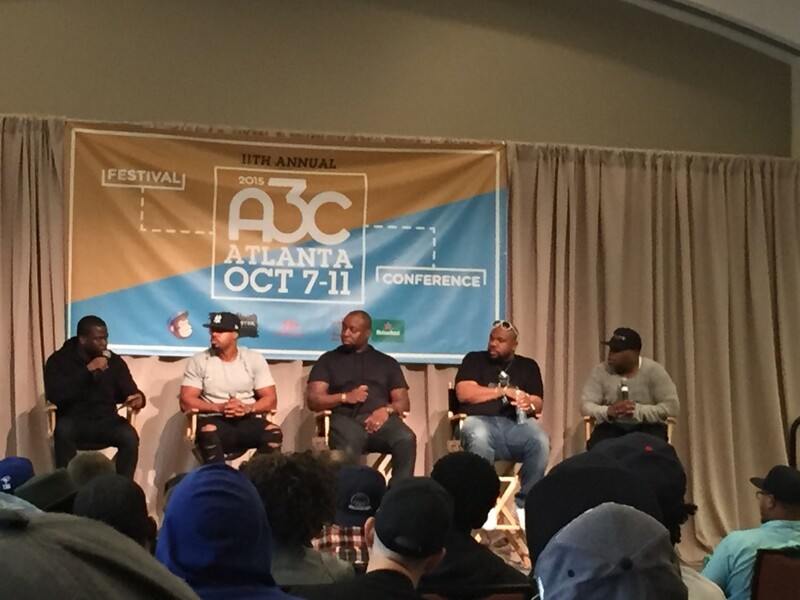 A3C [All 3 Coasts] Festival & Conference is the preeminent hip hop event in the US, showcasing 500+ artists, from living legends to aspiring talent, and 2015 happened to be the biggest year yet. 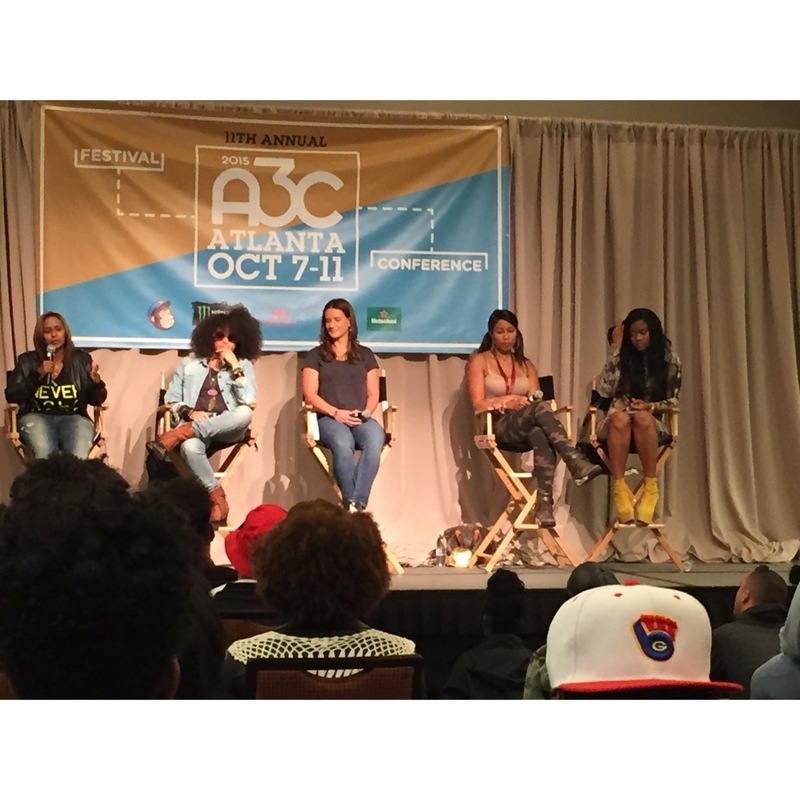 The 5-day festival takes place annually in Atlanta, GA and is an incomparable platform to interact with influential labels, brands, media and artists within the hip-hop community. 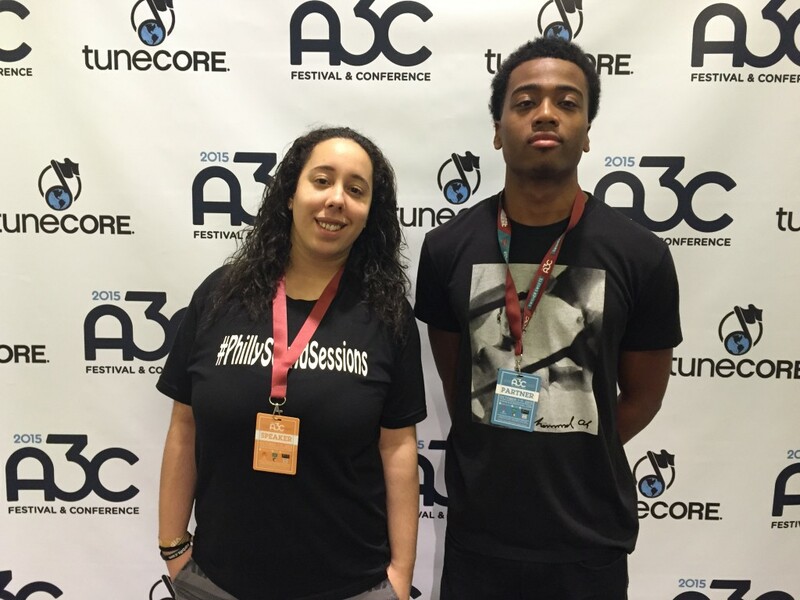 This year, our founder, Brianna DeMayo was invited by SonicBids to speak on their “Doing It Live: How to Get The Attention of Top Talent Buyers” Panel, representing her renowned Philadelphia showcase, #PhillySoundSessions. 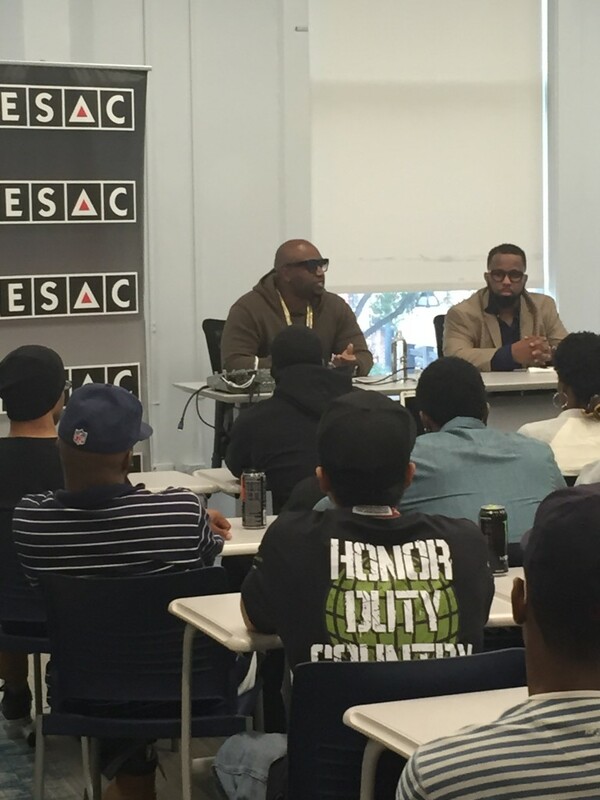 The panel had almost 200 attendees, which mostly consisted of indie artists looking for knowledge, as well as publicists, managers and other talent buyers. The panel lasted an hour and everything from “how do I get booked for a show” to “what really makes promoters want to book artists” was answered. Brianna received a great response from the panel that she had to stick around for forty-five minutes speaking with attendees and answering their questions. We would like to thank Kaylee over at Sonicbids for reaching out and making this happen. 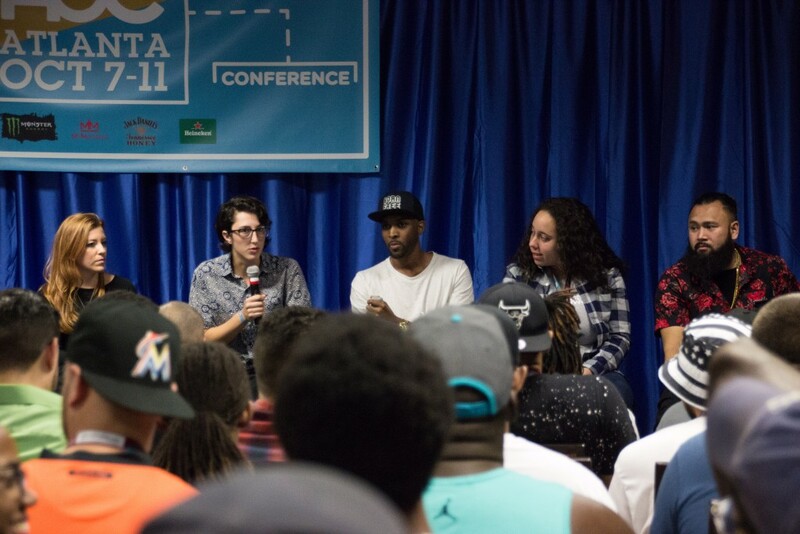 Check out some photos from our A3C festival journey below. This was totally unexpected, we had no idea that we would be included in this article but we are very grateful! If you’ve reached out to Cyber PR lately, you’ve more than likely been pointed in our direction. 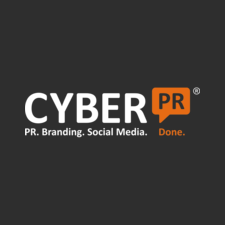 Cyber PR, owned by Ariel Hyatt, is a boutique online PR firm located in New York that has worked with more than 1,800 clients over 18 years in business. Exclusive Public has now partnered with Cyber PR to handle all of their urban clients (hip-hop, pop, R&B) and so far we’ve had a great outcome. We are excited to have partnered with such a reputable company and are looking forward to many years of continued business. This post was actually inspired by our good friend Matt Whitlock (@mattwhitlockPM). The other day he sent out some really amazing tweets about ways to get paid as an indie artist, so we decided to expand on those tweets in more detail. As you all have figured out by now, having a career in music is very expensive. You will need to invest lots of time and money in order to succeed at a certain level, BUT there’s no reason why you shouldn’t be seeing some sort of return of investment along the way. One of the biggest mistakes artists make in this situation is that they want to get paid, yet they don’t give anyone a way to pay them. What I mean by this is that although you have DREAMS of one day getting paid a ton of money for your music and by just being you, are you actually SETTING YOURSELF UP to get paid right now? Do you have a store on your website? Do you sell merch at shows? Or are you out here giving away free music and expecting to just magically start getting paid once you get a record deal? Let me just say this, there is money out there for you RIGHT NOW. So are you getting it? Or, are you waiting for it to fall on your lap? 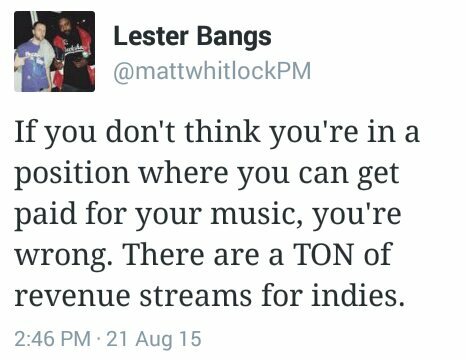 What a lot of indie artists fail to realize is that there are many other ways to make money with your art ASIDE from selling your music. As a matter of fact, with all the streaming sites out there now, music sales definitely shouldn’t be what you count on to fund your music career. You have to make money in other ways. Now we know that there are actually many articles that discuss the different ways that artists can get paid, but most of those articles talk about ways to get paid once you already have a big fan base built and already have songs on the radio. 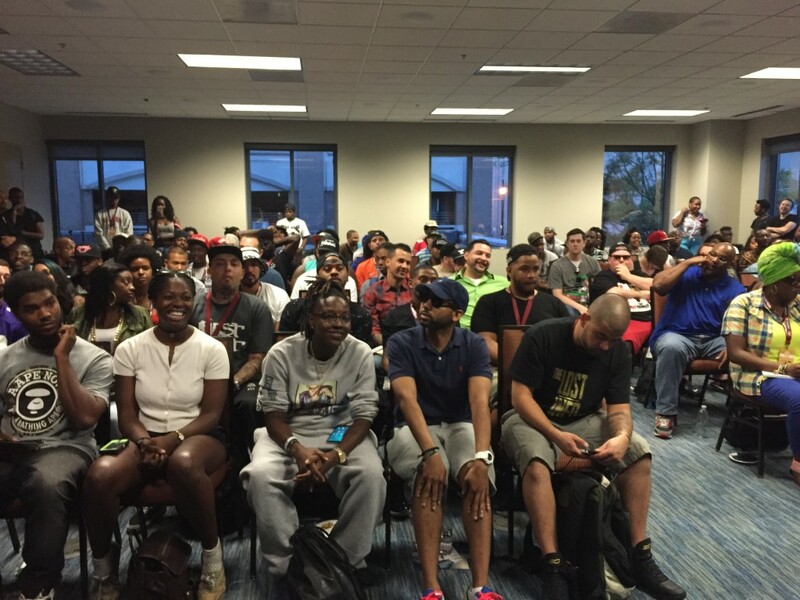 Our focus, right now, is to show the newer indie artists how to make money to invest back into their career. 2. Set up an online store where you can sell all of your merch items. You can even offer discounts (using discount codes) to people that subscribe to your mailing list AND you can bundle your music and merch in a package. The easiest way to do this is to use bigcartel.com to create your store and then link it to your website. (Then, when people go on your website and click STORE, it’ll take them directly to your bigcartel.com page). 3. Throw your own shows and make money off of ticket sales. Aside from getting booked to perform at other people’s events, you can actually contact the venue of your choice, work out a deal with them, and throw your own show. 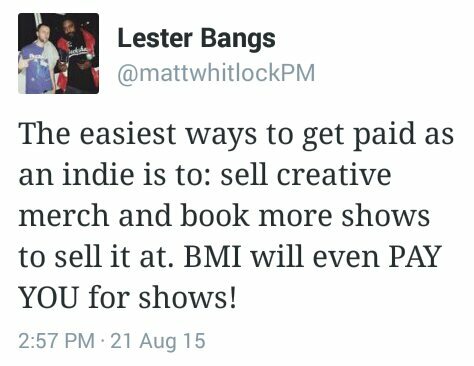 (Maybe add a few other indie artists from your area to the bill so that you’ll be sure to pack the venue.) Since it’s your show, you’ll make the door money. 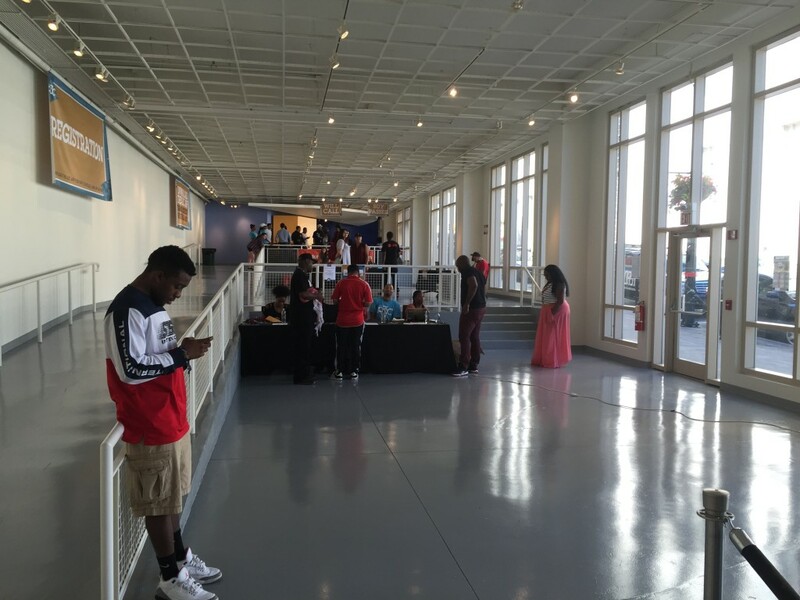 Depending on the size of the venue, you can come out with a few hundred to a few thousand dollars. It’s hard work, but who said this would be easy? If you’re interested, we can help you curate your own show, so feel free to contact us for help! 5. Get your music on streaming websites like Pandora, Spotify, and Tidal. We know that streaming doesn’t pay artists what they deserve to be paid, HOWEVER music streaming is now a really big way that people listen to music. So if you can’t beat ’em, join ’em! You can get your music on Pandora by following these steps. You can get your music on Tidal directly through their discovery platform, or by using a digital distribution service like TuneCore or CDBaby. You can also use either one of those to get your music on Spotify. These are only five of the easiest ways to get paid right now. There are many other ways that we will discuss in future articles. One of the most important things to remember is that in order to get paid, you have to make it easy for people to pay you. You have to offer a product. You have to remind everyone that you have products that are available. And, you have to make sure to get your music on platforms that have a large amount of listeners. If you need any help with this, don’t hesitate to contact us. Marketing yourself as an artist is an everyday thing. That’s the difference between marketing and promotion: marketing is an all the time thing, while promotion is for something specific (e.g., a music video), and it’s for a certain period of time. 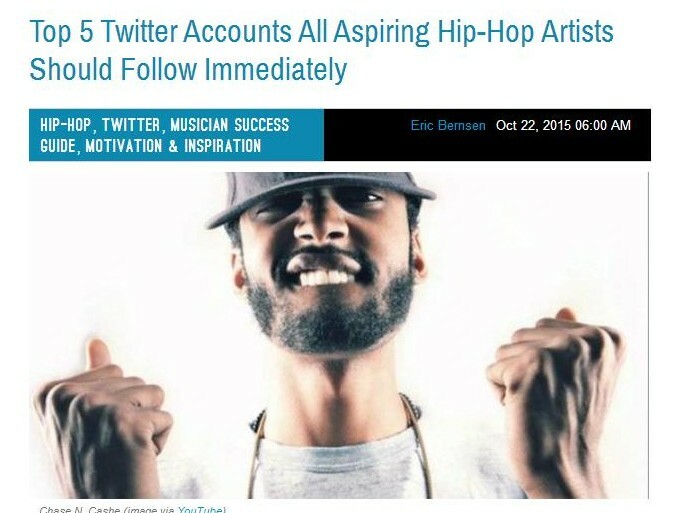 Social media is a very important aspect of promoting your brand and music. Most artists have a love/hate relationship with it, most don’t use it properly, and some don’t use it at all. However when you get the hang of it, social media can help you reach a huge audience. One of the biggest mistakes artists make when using social media is that they use it strictly for promotion. Social media should never be used strictly for promo. It’s called social media for a reason – you need to be social! People don’t want to see promotion all day. They will get annoyed and start to tune you out, so you need to produce consistent, entertaining content. Document your recording process with in-studio vlogs and photos. – Take a video of your friends in the studio jamming to your music. – Take a photo of yourself in the booth recording. – Take a video while sitting in the studio of you talking into the camera. Document your musical journey with behind the scenes photos and videos. – Take a photo and/or video of you rehearsing. – Take a photo/video of you at sound check. – Take a photo/video on the way to a show. – Take a photo/video of you writing a song. – Take a photo/video of you at a music event. – Take a photo/video behind the scenes at a photo shoot. – Take a photo/video behind the scenes at your new music video. – Take a photo/video behind the scenes at an important meeting. – Take a photo of a fan holding your new album. – Take a photo with a group of fans backstage at your show. – Repost photos that fans put up at your shows and shout them out. – Get videos of fans talking about your music. 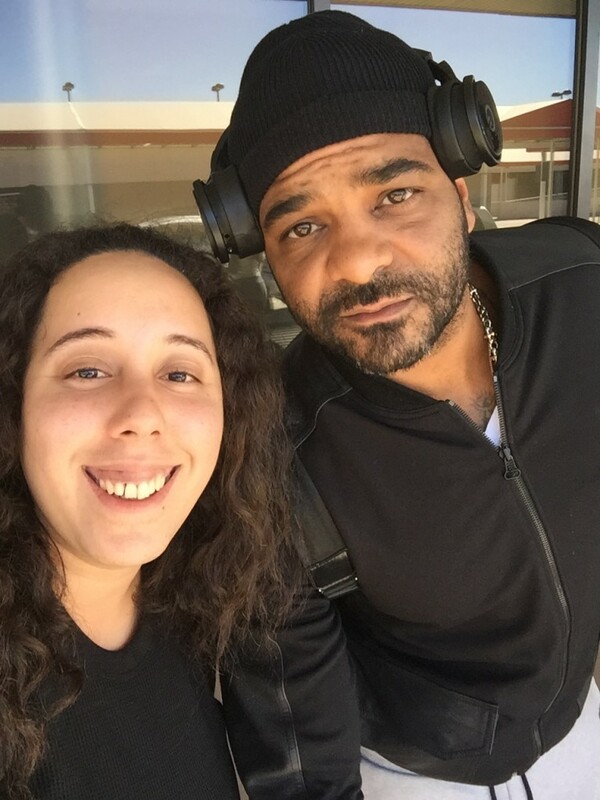 – Take a photo with another artist while you’re at their show or at an event. Share it, and tag them in it. – Take a photo/video with the people you meet along your journey (e.g., radio personalities, bloggers, event promoters, publicists, etc.) and shout them out. Get personal from time to time. – Post cool photos of your surroundings (e.g., random nice views from your city or wherever you are at the moment, cool art from your area, etc.). – Post random behind the scenes of your day-to-day activities. – Write inspiring captions for some of your photos/videos. – If you take a new photo shoot, you can upload a pic to Instagram. – If a photographer takes a cool shot of you performing, post it and tag the photographer. Post snippets of new singles and video releases. – Use Flipagram to create a clip with your album cover art and music playing. Repost almost everything that you’re tagged in. – If a fan or friend posts a photo of you, repost it! – If someone takes a video at your show, repost it! – If someone posts a screenshot of your new album cover, take a screenshot of their post and repost it! In order for your efforts to really make an impact, you need to be consistent and entertaining. If you’re not consistent enough, it will take people a lot longer to catch on. And if you’re not entertaining enough, people won’t pay attention. It’s not just about reaching more people, but getting your current fans/supporters more active (which actually brings more attention to you in the long run). – Try to tie in your everyday photos with your music. – Use an app like “square instapic” to make your photos look cool. – Use an app like “instashot” to add a cool white background to your videos. If you need some help getting the hang of things, we can create a social media strategy for you. Contact us to learn more. 1. Take Your Profiles Off Private. Being an artist and having a private social profile is one of the biggest contradictions of today. How do you expect a million people to like your photos, follow you, and retweet you if they can’t see your pics or tweets because your profile is private? You either want to be seen, or you don’t. As an artist, you want to be seen right? If there are certain individuals who you do not want lurking around on your Instagram or Twitter page, just block them, it’s that simple! 2. Make sure all of your social networks have the exact same name. When you’re on stage, would you rather tell the crowd to follow you on Twitter @Best_Rapper784_ or follow you on Twitter @BestRapper? What’s easier to remember? The second option of course. And wouldn’t it be even better if all of your social networks had the same name? That way they can follow you everywhere without you having to tell them a different name for each one. We also suggest that your username is the same as your website domain. For instance, we’re @ExclusivePublic on all social networks. 3. Put up the same profile picture on all of your social networks. Make sure that you’re using a high quality photo (preferably one from a photo shoot or a cool shot taken at one of your shows). You are representing your music, your artistry and your brand. It’s important that you look professional and that you’re easily recognized. 4. Spice up your Twitter bio with something catchy. Whether you add a cool lyric to your bio, or add your own unique tagline, you’ll definitely want your Twitter bio to say something other than indie artist, for bookings contact [email] – BOOOORING! There’s a million indie artists out there with booking info in their bio. What makes you stand out? Show your personality. Make people want to follow! And don’t clutter it up with a million hashtags either. 5. Buy your domain name and put up an official website. When people search for you, what comes up? Can they go online, buy your music, buy a t-shirt and a ticket to your next show? Can they subscribe to your mailing list? Can they even find you at all? Having your own official website makes it much easier to find you online and it’s an amazing way to keep your fans in tune with you and coming back for more. Once you create your website, be sure to add it to your Twitter bio, Facebook page, Instagram Bio, Youtube page, Soundcloud, and any other website that you use for your music. Overall you’ll want to remember that most of the time, the simpler the better. The easier you make it for people to find you, the more people will find you. The easier you make it for people to contact you, the better. Need some help promoting your music and brand? Let us help you.